What's the most difficult aspect of pulling off a great pasta dish? Well, following the sauce recipe to the letter may well be the answer. Unfortunately, pouring all the care and attention into that will backfire spectacularly if the pasta is overcooked. For those that want to achieve a state of perfection, the good news is that the pasta can rescue many an average sauce. Whatever shape is being used, ensure that the pot is of a generous size in order that the pasta has the freedom to move around in the water. A large amount of volume will also ensure that when the pasta is placed in the pot, it will not have the effect of lowering the temperature of the water. Remember that you have got to keep that water boiling so that the starch on the outside is broken up as quickly as possible and the cooking process towards the centre of the pasta can begin in earnest. On no account, leave your pasta to its own devices. It has got to be checked on a regular basis, firstly to ensure the water doesn't boil over and secondly to ensure that it is moving around freely and not sticking together. For string or ribbon shaped pasta, give it an occasional stir with a pasta fork to encourage momentum. And remember that the cooking time printed on the packet is only a guide. Lift out a piece from time to time and check how far through the cooking process it is. The same is true for home-made egg pasta, which should take no more than two to three minutes. When it is soft but retains a little resistance on the tooth, known as al dente, it's ready. On no account overcook it - it will taste vile. What about those who adhere to adding salt and/or oil to the boiling water prior to cooking? Those who favour the former say it adds flavour to the pasta and increases the temperature by a few degrees. The water temperature seems a rather spurious argument. It should be kept at a rolling boil, and if the heat needs turning up a tad to ensure this continues, then just turn it up. As for adding flavour? Like mashed potato, pasta should be a blank canvas that leaves all the glamorous stuff to the accompanying sauce. 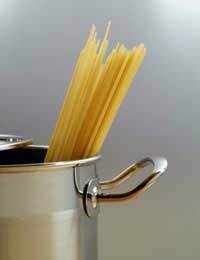 The addition of oil is believed to stop the pasta sticking together in the pot, but that will not be a problem if the pot of water is big enough and the occasional stir is administered. Many recipes advise reserving a little of the cooking water prior to draining the pasta because this will help loosen the sauce. The question is, why wasn't the sauce prepared to the right consistency in the first place? The other favourite is pouring the pasta into the skillet containing the sauce rather than the other way round. Does it make a difference? No, but it is important that the two are married prior to serving. Do not end up with a 1970s-style cookery illustration of a sea of pasta lapping limply around the shores of distant island of sauce. And if you are concerned about the pasta sticking together before reaching the table, toss it in a little oil prior to adding the sauce. The effect on the waistline is going to be negligible while the oil will bring a little added richness to the final dish.